The Morpheus (earlier Morpheus Venture Partners), a start-up accelerator which focuses on working with early-stage tech ventures, has announced its new fund called The Morpheus Tritiya. The fund is currently at Rs 3.5 crore, but can go up to Rs 4-Rs 5 crore depending on more confirmations. The new fund will be utilised to micro-fund 60 to 70 start-ups in the coming 3-4 years. The company has helped more than 30 start-ups at various stages of development in the past three-and-a-half years. "The Indian start-up scenario is very recent and the early-stage start-ups require a lot of help and support. They need somebody to hold hands and we provide the necessary guidance and support to them. We are trying to build a community where we can co-exist and support and learn from each other," said Nandini Hirianniah of The Morpheus. "The new fund (The Morpheus Tritiya) will be used for investments in the future batches, starting with batch 6. And the application process closes at the end of this month," she added. All the LPs in the first fund of The Morpheus have participated in the new fund. Additionally, there are new contributors. Some of the LPs in the fund are Vijay Shekhar Sharma, founder & managing director of One97 Communications Ltd; Anand Ladsariya, director & CEO of Everest Flavors Ltd; Pallav Nadhani, founder & CEO of Fusion Charts; Ravi Srivastava, managing partner of Purvi Capital; Saurabh Jindal, LP in Avishkaar & Morpheus Dwitiya; Anil Pandey, investor in LifeMojo â€“ a Batch 2 Morpheus Company and Nitin Agarwal, entrepreneur. Teams are selected once in 6 months by The Morpheus. For this, they need to submit applications and once selected, the teams receive four months of thorough support from the Morpheus as a limited co-founder. Each start-up can leverage the expertise of the Morpheus team (a community of 70-plus portfolio founders, investors and partners) and receives a sum of Rs 5,00,000, in addition to the lifelong support provided by the organisation. The Morpheus conducts 2 batches on a half-yearly basis, with up to 10 start-ups in each batch. First Fund Morpheus Dwitiya: How Did It Fare? 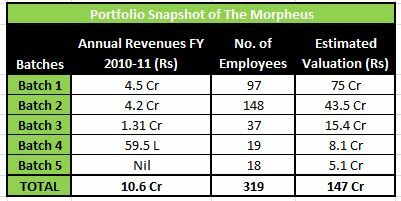 The first 3 batches of The Morpheus had around 20 start-ups in total, and were based on the 'non-investment model' which meant that training and support was provided but the monetary help was absent. After the 3rd batch the company raised its first fund Morpheus Dwitiya. The fund-raising started in October, 2009, and ended in February, 2010, during which a total sum of Rs 95,00,000 was raised. From Batch 4 onwards, 80 per cent of the funds raised were invested in the start-ups, which were a part of batches 4 and 5. Also, 20 per cent was kept for follow-on investments in the companies of the initial 3 batches. Morpheus has 31 companies in its portfolio and has seen one exit so far. Nine of the companies are profitable while seven have shut down. The company invested alongside Times Internet, Accel Partners, Top Tier VC and Venture East in institutional funding rounds of companies such as by Instamedia, Commonfloor, Crederity and Practo. Among its investee firms, profitable companies include Deskaway, Sutra People, Robots Alive, Reach Accountant, Phitesla, 99 Tests and MMP(make my point). When asked about future plans of The Morpheus, Hirianniah said, "We are planning to raise another fund which will be solely used for follow-on investments in the initial companies. But the details of the fund cannot be discussed now, since it is at a very early stage."